﻿Bruce Goodman's "Goldilocks the Prowler"
It was getting to be a bit of a habit. Goldilocks, in retrospect, had so enjoyed invading the house of the Three Bears, that visiting people’s houses when they weren’t home was becoming a bit of a habit. She’d visited the homes of the Three Raccoons, the Three Prairie Chickens, and the Three Coyotes. Next on the list was the house of the Three Beavers. Goldilocks the Prowler had to put on her swimming trunks to visit the Beavers because they had built their house on the water in the river. But it was no trouble. Goldilocks knocked on their door and of course, as she had suspected, they weren’t home. Goldilocks entered uninvited. First she sat in the chairs. Then she ate some porridge. Then she went to sleep in one of the beds. While she was asleep a storm swept through. 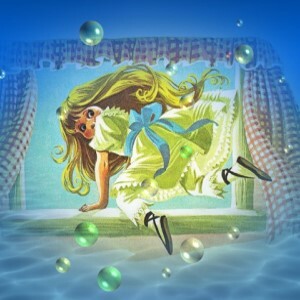 The river flooded, and Goldilocks drowned.